Almost exactly four years ago, my friend Miranda Edel and I were discussing the recent IPCC report on Climate Change and George Monbiot’s book _Heat_ and the reactions that we got when we talked about about the sheer depth of the reductions in climate emissions that would be needed to stabilize the climate. Whenever we began to discuss emissions reductions on the order of 80 or 90% (depending on your country of origin – for the US Monbiot’s estimate was 94%, although there are reasons to question that number now), the universal reaction we got was that it was impossible – impossible to imagine living in the developed world on so much less. So impossible there was no point in even discussing or imagining it. Miranda and I disagreed. We felt that this critical inability to conceive of what was necessary was something that we had to – and have to – overcome. Both of us were aware of material limits on a renewable energy build out, and the time frame for such a transition, and we knew that the evidence at the time increasingly suggested that we had to make our changes sooner than we could possibly imagine such an energy transition. Moreover, both of us looked at this through the lens of energy and resource depletion as well as climate change, recognizing that there were forces driving us towards a life with less whether we like it or not. Someone, we agreed, had to take the very first steps to conquering the underlying doubt that we can change. Someone had to do the basic work of establishing a vision of a life in the Global North that doesn’t include conspicuous consumption of energy. More importantly even, as long as we felt that our response to climate change and energy depletion had to wait on policy measures – to wait for the high speed rail lines and superinsulated new homes, to wait for carbon credits or whatever, we would not act. We needed to find a way to show that you can act right now – and make not a little tiny difference by carrying your cloth bag, but a big and measurable one – a change that nobody else thought was possible. We stole from George Monbiot the wonderful line “Nobody ever rioted for austerity!” He was right – no population in human history has marched and demonstrated to have less. We figured we’d be the first. Miranda and I set out to document our project and spend a year reducing our energy consumption by 90% over the average American’s. What we didn’t expect was that first dozens, then hundreds, and by the end, several thousand people joined us. We had expected to struggle. We hadn’t expected to find community, and most of all, to have fun. Perhaps we should have, though – as historian Timothy Breen has shown, rituals of non-consumption replace rituals of consumption and are as satisfying to most people as the consumption. That is, while during wartime, people might miss meat or sugar or drives in the country, that the communal exercise of substitution becomes a good in itself – so exchanging recipes for cakes that use less sugar and playing cards instead of taking drives becomes just as satisfying when you are acting together for a collective purpose. We set out to cut our usage in 7 categories – Electricity, Heating and Cooking Energy, Gasoline/Transportation Energy, Garbage, Water Usage, Consumer Good Consumption and Food Energy Consumption (we were not, in fact, striving to reduce our food intake by 90% ). We measured our baselines and ran the calculations. A few months into the project, my wonderful friend Edson built a calculator for us, so that you could just plug in your elecric usage and know where you were. People joined us from 15 countries – and did their own baselines and measurements. We had people from cities and countrysides and suburbs, the elderly and families with multiple children, the healthy and the disabled, the rich and the poor. We listened, shared strategies, argued about the best way to do things. We tried things and failed. We got frustrated when it seemed like it would never work. We celebrated, as for example, when there was a Riot for Austerity wedding! Some fundamental revelations emerged. The first was that the first 50% reduction in energy usage isn’t that hard for most of us – that was heartening. Most people could get big drops in energy usage by making changes that weren’t too difficult. After that, of course, it got harder. We also found that most of us had a Waterloo – a place where we found ourselves struggling. Out here in the country it was transport energy. In the cities, it might be food and consumer goods. We shared our struggles, and thrilled when someone made it – our friends Larry and Gail dropped their electric usage to well below 90%. Someone asked “do you even live in your house?” Not only did they live there, they worked out of it too! In June of 2008, my family had achieved 80% in all categories, at least at one point. We had achieved our 90% goal with water usage, but slid back up again to about 60% down from the American average, as our climate became increasingly wet – our 60+ inches of rain annually simply meant we didn’t feel we had to reduce our water usage quite so much. We were never able to consistently keep transportation energy down to 90% – my oldest, disable son’s busing and the distance from Eric’s job made that harder for us out here in a rural area. We had to settle for using only 4/5ths of the energy used in most households. We have kept our energy levels down at the 80% mark for the most part, except for water and a home renovation project that put us well over the consumer goods limit one year. By the end of 2008, a great deal of more data about climate change had emerged, and between that and the lack of political action that followed President Obama’s election, it became clearer and clearer that world action on climate change either had not or would not come in time (depending on whether you think we’re already past critical tipping points, which may be the case.) While we’d never expected to change the world wholly, even the most dedicated families, the ones who had been living the Riot most passionately began to ask the same questions – why should I do this if it isn’t going to make any difference? Meanwhile, my appearance in the New York Times as an advocate of carbon restriction had been played to create a new pathology – the Riot for Austerity wasn’t even mentioned, and I was classed in a story with other environmental activists as a “Carbo-rexic” – someone who was pathologically afraid to use their fair share of carbon. The story did its best to portray me as a bad mother – taking several remarks out of context and implying that my children were freezing to death in their home (actually, when the article was run, the photographer wanted to take pictures of them under their blankets, but they declined because it was 80 degrees ), saying they “huddled together for warmth” (again, it was 80 – no huddling!) and implying that we didn’t let our son play baseball, the great American pastime because Mom is an environmental meanie. For a couple weeks after we were bombarded with threats to call CPS, and we were afraid we would be investigated. It left me with a bad taste in my mouth about exposing my family’s experience in too much detail. The Riot, born of the attention to climate change that followed 2006-7 emerged from a hope that it was possible to create a grassroots, collective response to climate change that would accompany other responses. As it became more obvious that 90% wasn’t enough, that 350, not 450 was the target and that we weren’t going to do anything about climate change, I shifted my focus towards adapting to energy and economic issues. While we still used comparatively ilttle energy, we focused more on “Adapting in Place” than on Rioting for Austerity. I’ve come to believe there are three reasons. The first, is that it isn’t that hard – and that getting the most out of little is an art form, a pleasure, a life worth having and enjoying. The second is the reason articulated by my old friend and colleague Dmitry Orlov, where he observes that if you are facing a fall out of a window, you’d probably prefer to fall out a first story window, rather than a second story window – that is, everything you can do to get yourself closer to the place you are going anyway softens your fall. The third is that it is simply right. Our narrative in which we in the Global North use so much more than everyone else on the planet implies that no one else minds, that such inequities are fundamentally normal and acceptable. But, of course, everyone else does mind. Our actions make their world less habitable. Our consumption leaves less for our posterity. This is wrong – and it is based on a fundamental lie. We must find a way to change our lives, not so much because it might save us from the worst consequences of our behavior – might spare us the floods, the heat waves, the hurricanes, the tropical diseases – that’s just getting out of the logical consequences. Instead, we have to change our ways because they are wrong, and we should do right instead. 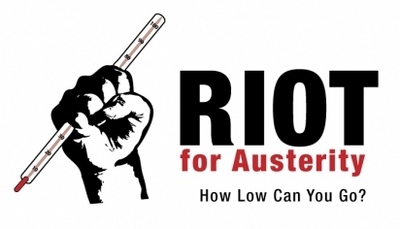 So starting on June first, I’m revisiting the Riot for Austerity – my family is going to try and get back down in some of the places we’ve crept up, and we invite the rest of you – those of you who did it before, those of you who never to join us. I’ll make some changes here – we’ll probably make our group go on facebook instead of yahoogroups (not 2007 anymore ), and I need to run a new set of numbers, as the data for the American baseline has changed, but the basic project is the same. So is the basic goal – as long as most of us in the North feel that there’s nothing we can do but cling with both hands to a way of life that is doomed, we will both suffer the consequences of our clinging and also doom others with us. The moment we can find a way out, a new story to tell, a new way of life, and the power to act on our own, we begin again. There’s more to come, as with all new beginnings! Oh, I am so glad you decided to start up with this again! I just finished reading all three of your books and I had tried to find anything on this Riot for Austerity, and I always came up blank. I would love to join you in this quest. I am not on facebook, but I guess I would consider joining if that is the only way to gain access to others doing the same thing. Looking forward to knowing more about this subject. Oh great! I missed it the first time around, and I’m really wanting to take part. Horay! I too have been soldiering forward on my own since reading your first books (sorry about the persecution they exposed you to). My family reduced electricity by 20% in a colder winter and are looking for more ideas. Thank you so much and count me in! I came to the original riot so late it was practically over, so I would love to get on board with this one. I think it’s important for all of the reasons that you mention, and it would be good to get down to brass tacks about what exactly needs to be done and have some measures to quantify it. I’ve been trying to get myself motivated to start the Riot for over a year but without some type of support network it keeps getting moved to the bottom of the pile. Personally I am not a member of facebook and have reasons why I never intend to be so it sound like this may not work for me either. I’m so glad to see this. I participated in the original Riot and we were able to do very well, but 4 years and lots of changes later . . . We’ve been re-evaluating, making changes, and I had actually started running all the numbers and planning a set of blog posts. So, Yeah! I’ll be back on board with you all when you start! I would love to do this, but am not planning to join Facebook. Is there another way to have the support group discussions? Here’s the issue re:facebook – whether we do this in a traditional groups format or on facebook, there will be people who refuse to participate in one media or the other, and I personally don’t feel up to organizing multiple groups – I have enough trouble keeping up with one. So while certainly we can do some stuff in comments here, in the end I’m just going to have to pick one, and people will decide whether to join or not. Sharon — I’ll be on board no matter which direction you decide to take.